An artist's illustration of an 880-lb. (400 kg.) space rock just before it slammed into the moon on Sept. 11, 2013 to create the brightest lunar impact flash ever seen. The meteorite impact carved a crater in the lunar surface 131 feet (40 meters) wide. The March full moon will rise on Sunday night (March 16) in a brilliant display that will allow Internet denizens to investigate the site of the most brilliant lunar explosion in a free live webcast, weather permitting. This month's full moon — which officially turns full at 1:08 p.m. EDT (1708 GMT) Sunday — is called the "Full Worm Moon." The seemingly odd name comes from the appearance of earthworms as the ground softens after winter thaws. The online Slooh community telescope website will use the full moon event to examine an impact site in the Mare Nubium lunar basin. The webcast begins at 9 p.m. EDT (0100 March 17 GMT). You can view it directly through the Slooh website, or watch the full moon webcast live on Space.com. The target of Sunday's Slooh lunar webcast is a region of Mare Nubium, where brightest asteroid strike on the moon ever seen was spoted last year. The asteroid was traveling at about 37,900 mph (61,000 km/h) when it slammed into the moon, creating a crater about 131 feet wide (40 meters) on Sept. 11, 2013. Scientists announced the discovery on Feb. 24 of this year. The impact of a large meteorite on the lunar surface on Sept. 11, 2013, resulted in a bright flash, observed by scientists at the MIDAS observatory in Spain. 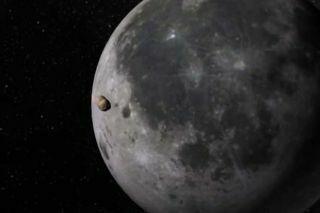 If a space rock of the size of the lunar hit struck the Earth, it would likely create an amazing fireball in the sky, but it would pose no threat to people on the ground, researchers have said. The impact was so spectacular on the moon because the natural satellite's extremely thin atmosphere (called an exosphere) does not protect the lunar surface from strikes like this one. "Ever since Luis and Walter Alvarez astonished the world in 1980 by presenting convincing evidence that an asteroid impacted our planet and wiped out the dinosaurs 65 million years ago, the threat of an Earth-altering collision has remained in the public awareness," Slooh astronomer Bob Berman said in a statement. "The astonishing double-whammy of Feb. 15, 2013, when an asteroid-near miss occurred on the same day that an asteroid fragment exploded over Siberia, injuring 1,500 people, underscores the reality of thousands of uncharted asteroid fragments that can cross our path at any time. In the past year, Slooh has managed to track and image several of these in real-time, and displayed these encounters to the public as they happened." Sunday night's full moon is not only known as the Full Worm Moon. It also carries the name "Full Crow Moon" for the cawing crows that signal the end of winter, and the "Full Crust Moon" for the crusted snow created by repeated thawing and freezing. Editor's note: If you take an amazing photo or video of the March full moon, or any other night sky view, and would like to share it with Space.com for a story of image gallery, send images and comments to managing editor Tariq Malik at: spacephotos@space.com.